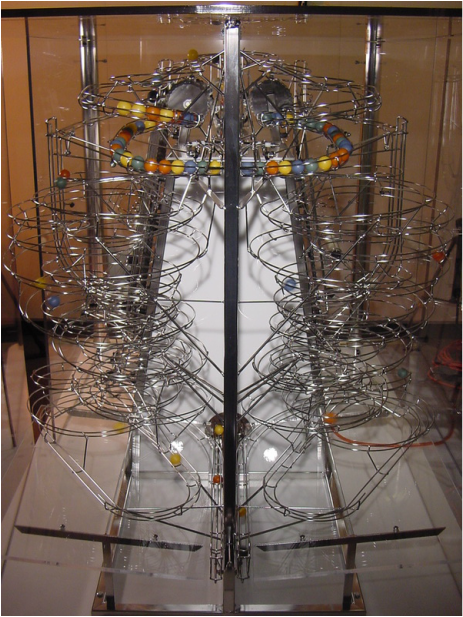 The Emulator is an awesome example of a mechanically complicated Rolling Ball Sculpture. It was designed to compare two different microprocessor technologies. The first being a traditional microprocessor in which only one command line can be processed at a time. The second being a microprocessor with four layers, allowing multiple operations to be processed in a single chip at the same time. To achieve this, I created a sculpture that has two sides, one for each processor. 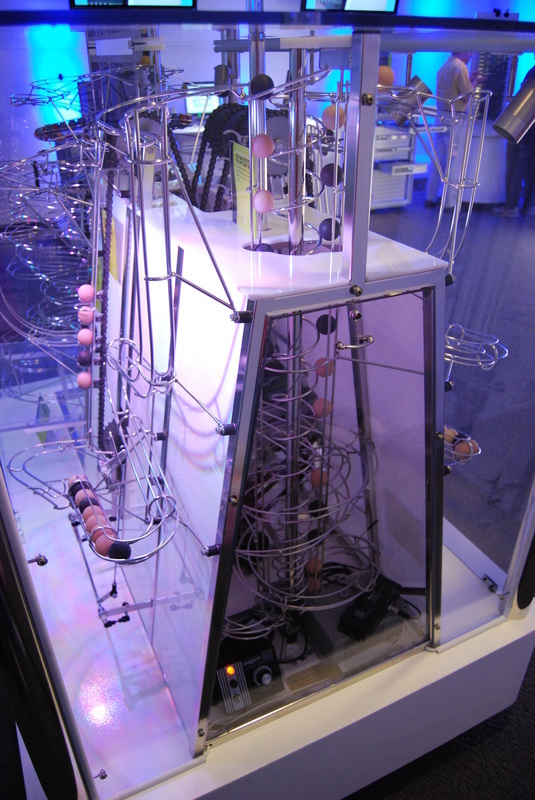 To see the advantages of the layered processor, one end of the display case has two spiraling tracks that are mirrior images of each other. This allows you to view both sculptures simultaneously and compare the "throughput" of each side. It becomes obvious that the multi-layered processor side is fully active at all times, while the traditional processor starts and stops constantly. 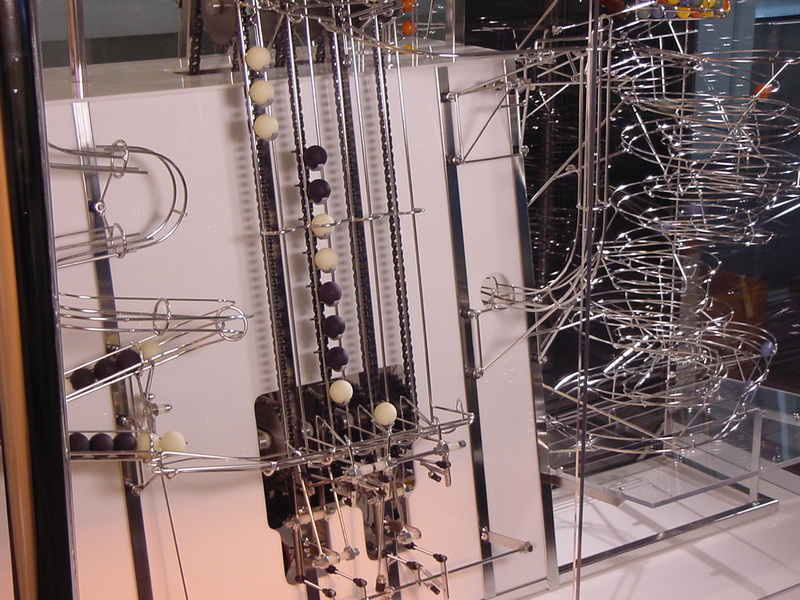 The Emulator uses rolling balls to represent digital information traveling through microprocessors containing different architecture. 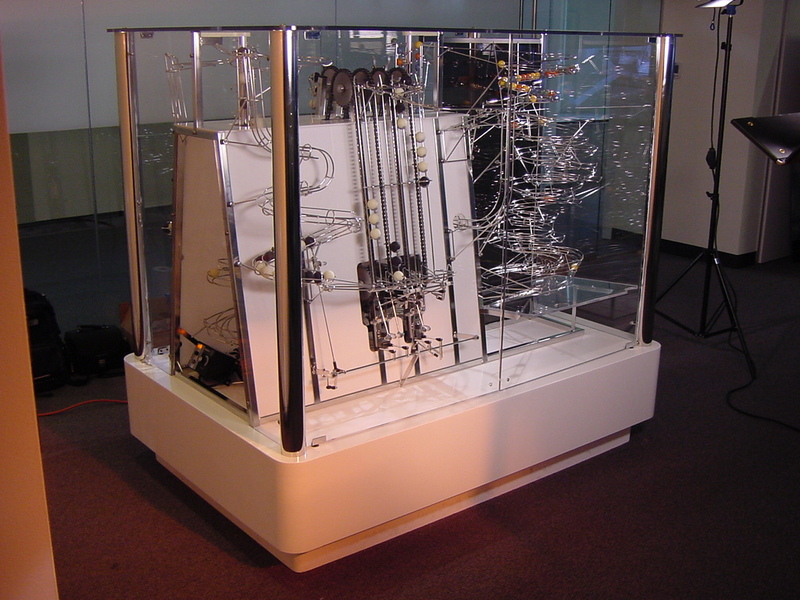 The traditional, single-thread processor is represented by a single chain-lift. 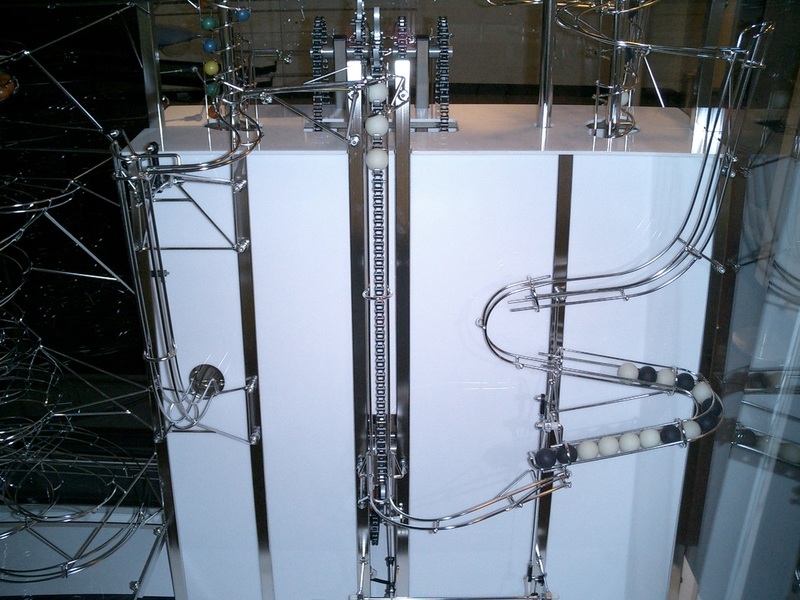 The multi-threaded processor is represented by four chain-lifts operating in unison. Complicated linkages handle the timing of the ball release and chain-lift pick-up. Looking at the end of the sculpture, two identical, mirror-image sculptures can be seen. The left side is for the multi-threaded processor, and it is always in motion. 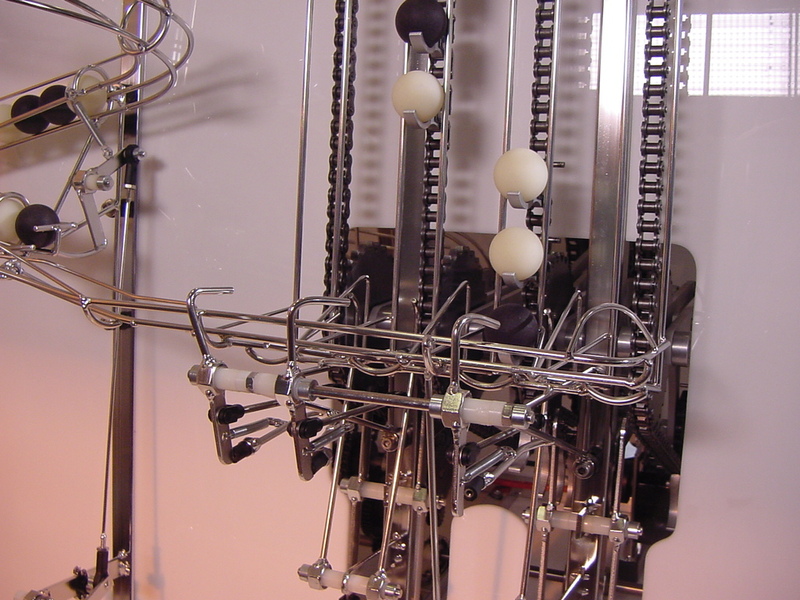 The right side is for the single-thread processor, and its motion starts and stops. 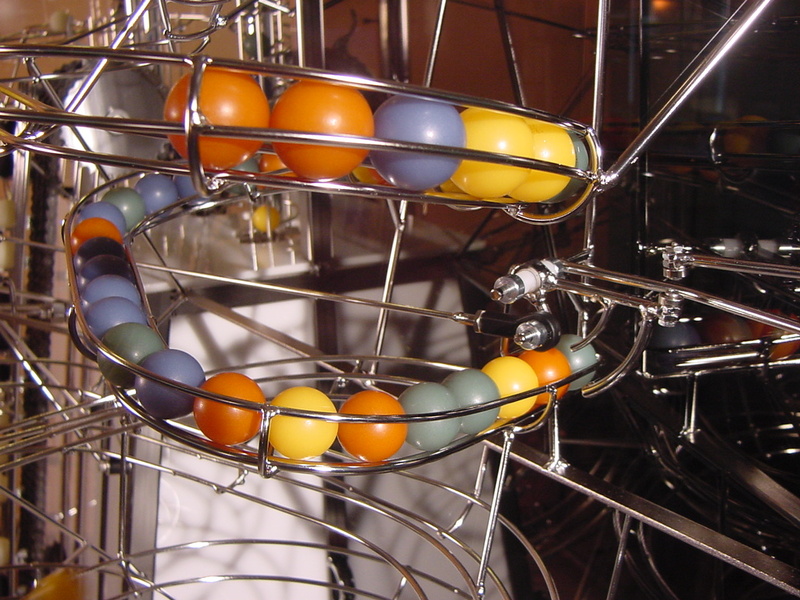 The workload section of the sculpture required an extremely large ball queue to meet demand from the ball release mechanism. This end of the sculpture has a window so you can look inside the white tower. You can view the motor and all the gears, sprockets, and chains. This is also where all the balls hop back into the screw lifts.